President of the Sinhala Buddhists only on his 3rd term? 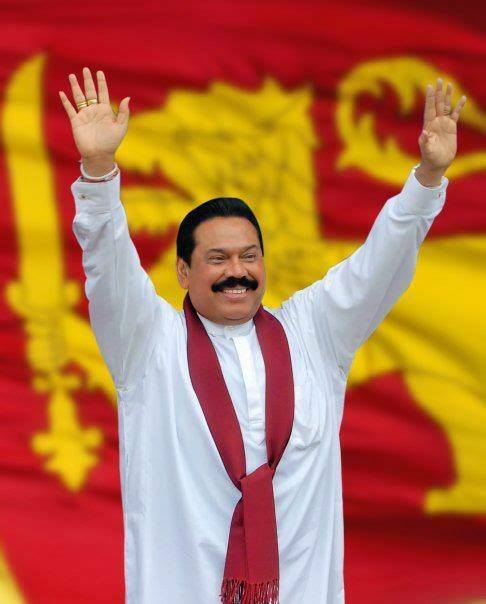 Mahinda Can Win Without Minority Votes. A strange phenomenon on the streets of Colombo! It was the morning of 29th of November; I was at the wheel at a busy intersection, waiting for the light to turn green. There were groups of people (many) distributing election propaganda material to people in passing vehicles and pedestrians. Someone walked up to my vehicle and offered a booklet. He turned towards the vehicle parallel to mine, and stopped, turned and walked away to give those booklets to other vehicles waiting for the green light. I noticed that the vehicle that was not given the booklet had a man and a woman inside, and the woman had her head covered, a Muslim. This intrigued me very much and as the lights turned green, I had to move on due to the heavy traffic behind me. I drove a few hundred yards, but could not resist turning back. I drove back and parked myself on the opposite side of the road and watch the unfolding events. I observed that the people distributing this propaganda material to pedestrians avoided giving these booklets to people who seemed Muslim and wearing the Islamic attire, women wearing black maxis and the men with beards and in Arab gear. They offered them to all other people who walked by. They also avoided two women who were wearing the south Indian salwar kameez, probably assuming them to be Muslim women. I was concerned that the literature being distributed were intended to cause racial hatred but to my surprise the distributed booklet was promoting the incumbent President as the most suitable candidate in the upcoming elections. Why would they avoid the Muslims? Could this be the work of Mahinda Rajapaksa’s latest declared ally, the Bodu Bala Sena or any of the other extremist groups he and his brother, Defence Secretary Gotabaya Rajapaksahas been using against the minority Muslim and Christian population. According to sources close to the Church of England, Buddhist extremists have unleashed over 140 incidents of violence on evangelists and their places of worship. A source close to the office of Prince Zeid Ra’ad al-Hussein, the new U.N. High Commissioner for Human Rights, there are much larger evidence of violence, threats and intimidation of Muslims during the last three years. Many mosques and businesses of Muslims have been targeted. A local civil society organizations, the secretariat for Muslims, claims this number to be over 350 incidents. Justice Minister and the Sri Lanka Muslim congress have made the hate campaign, assault and threat to the Muslim community as one of their main grievances when they met the president a few days back to discuss their support at the next presidential elections. Did they asked him to discard the Bodu Bala Sena (BBS) from his election campaign? The Bodu Bala Sena is not the only force that has been controlled by the president and his brother, they include Sinhala Ravaya , Ravana Balaya. When is he going to let the other pawns in the racist card start their political campaign in support of his candidature? Maithripala Sirisena, on the other-hand played his cards well by ensuring the minority Christian and Muslim votes by rejecting the offer of support by the Bodu Bala Sena. Was this a genuine declaration by him or a vote grabbing strategy? He too is considered a Sinhala Buddhist who would play the racist card to woo the Buddhist vote. Did the United National Party, who would have got the majority of the minority votes instrumental in ensuring that the minorities stuck with the common candidate, Maithripala Sirisena? Venerable Maduluwawe Sobitha Thera, the charismatic Buddhist prelate who would have won the hearts of majority Buddhist was not considered because of the possible loss of minority votes due to his robe. Will this be capitalized by Mahinda Rajapaksa to woo the majority Buddhist votes by building a larger Buddhist alliance sans the Jathika Hela Urumaya (JHU)? I wonder if President Rajapaksa has made up his mind that he doesn’t need the minority votes. Is he going to be a president of the Sinhala Buddhists only on his 3rd term? Can he afford to ignore the votes of the Muslims and Christians? Or is he feeling that it is a lost cause, that he has already lost their vote.